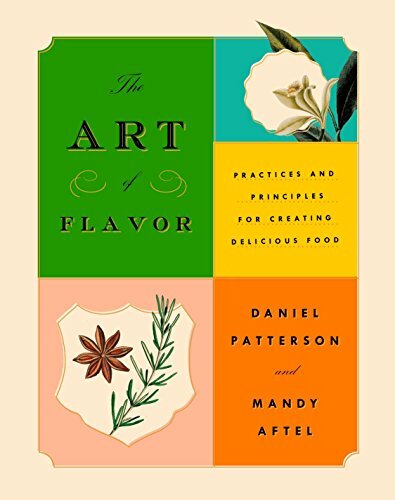 A collaboration between James Beard Award-winner Daniel Patterson and internationally recognized artisan perfumer Mandy Aftel, The Art of Flavor: Practices and Principles for Creating Delicious Food is an exercise in understanding how flavors are created in food, how they act, and how to improve on them. Working on their second publication together (after 2004’s Aroma: The Magic of Essential Oils in Foods and Fragrance), Patterson and Aftel aim to help home cooks make the most of their ingredients through a set of principles and guidelines provided for the reader. The authors clearly understand their topic, and their energy and passion for the subject is obvious. The book implores the reader to consider ingredients as the “most basic building blocks in cooking.” Initially using the comparison of two different kinds of apple as an example, the authors present concepts such as character, texture, and intensity as ways to think about ingredients in a more precise way. Once the reader has a better understanding of how to appraise their ingredients, it’s on to the book’s theories on putting it all together. Chapter four outlines the Four Rules of Flavor. Similar ingredients need a contrasting flavor. Light flavors need to be grounded. These concepts empower the reader to interpret what they are cooking, whatever that may be. A valuable aspect of the book is the ability to give the reader concrete guidelines to follow. Chapter eight, The Seven Dials, provides just the right amount of clear direction without inundating the reader with rule after rule. Referring to seven different adjustments a cook can make to balance a dish (salt, sweet, sour, bitter, umami, fat, and heat), Patterson and Aftel let their experience flow. Salt pushes down sweet. Bitter is tamed by sour, salt and fat. Fat balances sour. These simple statements allow the reader to internalize useful concepts without drowning in details. Examples and recipes are given for each to support the concepts and give the reader ways to try out the ideas. The book includes over 80 recipes, encouraging us to look at common foods in uncommon ways. The recipes are surprisingly simple while being interesting and creative. Instead of plunging penne and meatballs into the usual red sauce, Patterson and Aftel entice us to try a citrus-herb sauce. The sweet, fatty texture of brisket melds with the bright, energetic tones of tomatoes, allspice and lime. Even vanilla ice cream is elevated by black peppercorn. Each recipe is clearly written and easy to follow, using ingredients typically found in most supermarkets. The writing is engaging and the guidance is solid, although at times the sheer intellectual depth of the conversation makes this less of a casual read. While this book may not be the go-to for those who need to get dinner on the table in a jiffy, it will certainly benefit cooking enthusiasts who find food science fascinating and home cooks looking to up their game a level. It is well worth a coveted slot on the cookbook shelf. Adam Centamore is a professional wine and cheese educator in the metro Boston area, teaching private and corporate seminars and events. He is also the author of Tasting Wine and Cheese: An Insider's Guide to Mastering the Principles of Pairing, an International Association of Culinary Professionals Book of the Year finalist, and a contributing writer for various media outlets.